With Bruno Latour and Olafur Eliasson. Collaboration between Master of Experimentation on Arts and Politics, Sciences Po, Paris, and Institut für Raumexperimente, UdK Berlin. Reenactments, Catastrophes, and Gaia: Lecture by Bruno Latour. Guided tour of Studio Olafur Eliasson. 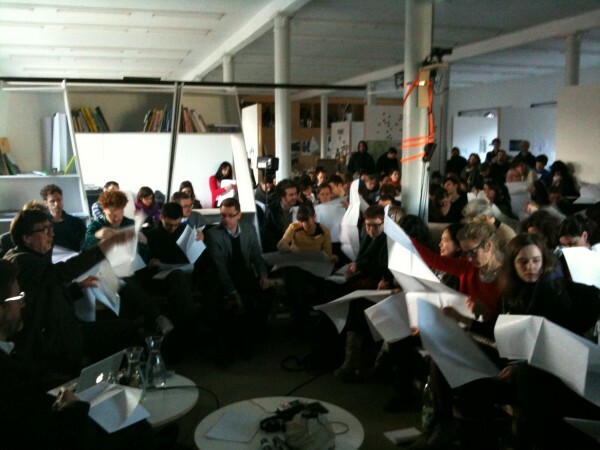 Making Time: Conversation with Bruno Latour and Olafur Eliasson. Gunter, Peter Addisson Y., „Henri Bergson, Albert Einstein and Henri Piéron. Remarks Concerning Relativity Theory“, in: ders., Bergson and the Evolution of Physics, Knoxville 1969, S. 123–135. Latour, Bruno, „Some Experiments in Art and Politics“, in: E-Flux Journal, 23, New York 2011, http://www.e-flux.com/journal/some-experiments-in-art-and-politics/ (abgerufen 2011). Latour, Bruno, „Spheres and Networks: Two Ways to Reinterpret Globalization“, in: Harvard Design Magazine, 30, Harvard 2009, S. 138–144.